At the U.S. Capitol, anticipation has reached a fever pitch over Pope Francis’ address to Congress on September 24. And no one is more excited than the man who invited him, devout Catholic and House Speaker John Boehner. In a special video, Boehner said lawmakers are very interested in what His Holiness has to say. Some analysts say those controversial positions could end up making Boehner regret his invitation. Pope Francis has spoken out strongly about the dangers to our planet posed by economic injustice and climate change, and the Vatican has welcomed the Iran nuclear deal. The pope’s positions on these issues are closer to Democratic President Barack Obama’s views than those held by leading Republicans. Father Thomas Reese, the senior analyst at the National Catholic Reporter, said Congress' reaction to Pope Francis should be fascinating to watch. Republican Representative Paul Gosar of Arizona says he will boycott the speech because of the pope’s focus on what Gosar calls the “fool’s errand” of climate change. Gosar, who is Catholic, wrote, "When the pope chooses to act and talk like a leftist politician, then he can expect to be treated like one." On the Democratic side, Representative Luis Gutierrez of Illinois contrasted the compassion of Pope Francis for migrants with the harsh, anti-immigrant rhetoric of leading Republican presidential candidate Donald Trump. "In many ways, Pope Francis represents the anti-Trump, the antidote to his venom. I, like a lot of my Democratic colleagues and a lot of my Catholic colleagues — and frankly, the majority of Americans of all faiths and political stripes across the nation — are very much looking forward to the pope’s visit and the pope’s words because our nation needs a counterbalance, a counterweight to what has become the ugliest, most xenophobic, most anti-immigration campaign in anyone’s memory," said Gutierrez. Billionaire businessman Trump has said some illegal immigrants are "rapists" and "criminals," and that “when Mexico sends its people, they're not sending their best." On other issues such as gay marriage and abortion, the pontiff may say things many Democrats do not like. Democratic House Minority Leader Nancy Pelosi of California is also a devout Catholic, but a strong supporter of women's reproductive rights and gay marriage. 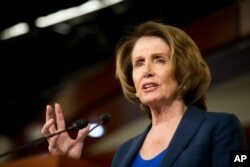 FILE - House Minority Leader Nancy Pelosi on Capitol Hill in Washington. It may take more than even a visit by Pope Francis to get members of Congress to stop fighting and work together.